Everybody loves Jeff Goldblum. And the T-Rex’s roar and water ripple in Jurassic Park are iconic for good reason. 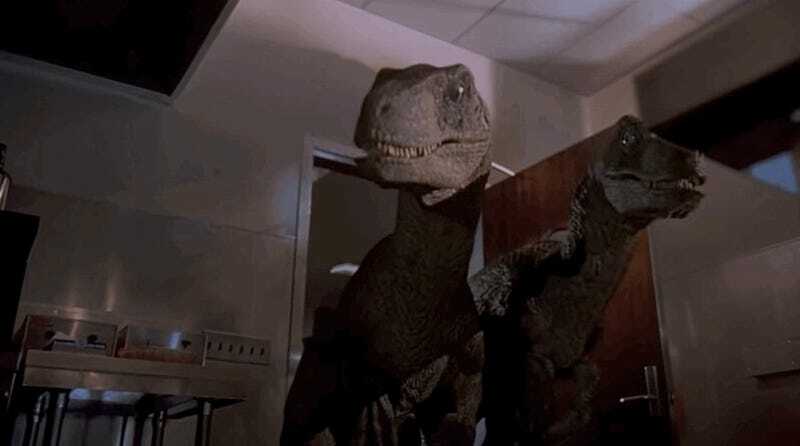 But there’s only one true star of the Jurassic trilogy: the Velociraptors. They’re the best villains, and what the stupid people in the park should fear most of all. Here are 10 reasons that Velociraptors steal the show. The whole reason that any of the characters show up on the island to do a dry-run of the Jurassic Park theme park is because a worker there is eaten by a Velociraptor. That’s what scares the investors into forcing John Hammond to do that disastrous test run of the park. Without the Velociraptor, no one but the staff would be there when everything shuts down. A turkey, huh? OK, try to imagine yourself in the Cretaceous Period. You get your first look at this “six foot turkey” as you enter a clearing. He moves like a bird, lightly, bobbing his head. And you keep still because you think that maybe his visual acuity is based on movement like T-Rex - he’ll lose you if you don’t move. But no, not Velociraptor. You stare at him, and he just stares right back. And that’s when the attack comes. Not from the front, but from the side, from the other two raptors you didn’t even know were there. Because Velociraptor’s a pack hunter, you see, he uses coordinated attack patterns and he is out in force today. And he slashes at you with this, a six-inch retractable claw, like a razor, on the the middle toe. He doesn’t bother to bite your jugular like a lion, say . . . no no. He slashes at you here, or here . . .
Or maybe across the belly, spilling your intestines. The point is, you are alive when they start to eat you. So you know, try to show a little respect. Velociraptors: They’re why you should be terrified. The end of Jurassic Park: The Lost World is so bad. The evil humans take the T-Rex baby and the sedated T-Rex back to California, where the T-Rex then does her very best Godzilla impression and destroys San Diego. It’s so stupid for them to try to capture a T-Rex. It’s even stupider that they take the baby, which is what caused the rampaging back on the island. And it’s monumentally stupid to transport the whole kit and caboodle to San Diego. The movies should have ended with the humans outwitting the Velociraptors, signaling for help, and getting off the island. After Jurassic Park, we’re conditioned to be more afraid of them than the T-Rex. And, as bad as the use of gymnastics is as a weapon against the Velociraptors, it’s still less stupid than the ending we got. Like the kitchen scene, it’s a tenser fight than the ending chase. Where the prevailing image seared into my brain is of Jeff Goldblum and Julianne Moore driving around San Diego with a screaming baby T-Rex puppet. A smart villain is always more fun than pure muscle. The T-Rex is great and all, but she’s a jock. Who can be outwitted by standing still. Which we all know, because the movies mention it constantly. You know who can’t be outwitted by just standing still? Velociraptors. By the third movie, they’re using live humans as bait for other humans. They have strategies and plans. All the other dinosaurs are just instinctual, which makes them wonderful animals, but not compelling characters. I don’t think it’s a coincidence that Jurassic World’s plot is about a dinosaur further genetically modified to be smart: generalized danger just isn’t as fun as a smart villain. Nothing about the T-Rex attacks is subtle. The water trick is iconic, but it means that we always know that she’s coming. Velociraptors, on the other hand, are quiet. It’s like, the T-Rex attacks are big action set pieces, while the Velociraptor hunts are more like psychological thrillers. 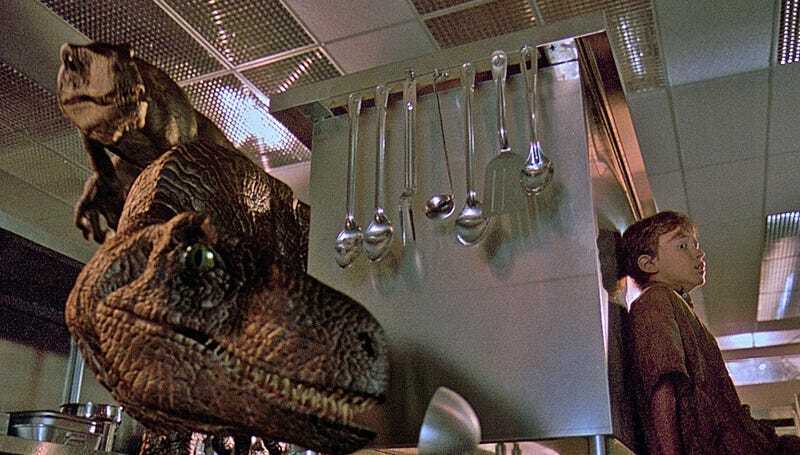 In Jurassic Park, the T-Rex attack on the car is scary, but I’m far more worried for the kids in this kitchen scene. It’s tense, it’s suspenseful, and the things are just so quick and agile — rather than big and blind — that you’d really panic. They show extreme intelligence, even problem-solving intelligence. Especially the big one. We bred eight originally, but when she came in she took over the pride and killed all but two of the others. I WANT TO WATCH THAT MOVIE. Wouldn’t you watch a whole Jurassic Park prequel about the pack politics of the Velociraptors? And the scientists and park managers discovering what’s happened, and somehow still deciding that the park’s a good idea. That’s what makes the Velociraptors stars: we want to know more about them, while we’re perfectly happy not to know anything further about the humans. Another thing that makes the Velociraptors of Jurassic Park stand out among the rest of the dinosaurs is how well they work together. In the kitchen scene, there’s a moment where one snaps at another, and they seem to split up to search more effectively. In The Lost World, it’s a pack ambush that nearly takes out everyone. The pack dynamics, both the struggles and the teamwork, give more layers to the Velociraptors than any of the other dinosaurs we see. And then, in Jurassic Park III, they’re practically talking to one another. We’ve clearly moved to the point where Velociraptors are far above any other dinosaur we see. They’ve been anthropomorphized the most, to the point of speech. Jurassic World’s trailers and posters have played up the “raptor pack” a lot, and it’s because there’s no other dinosaur that we could reasonably have this relationship with: they’re the ones that we’ve shown can plan, work in teams, and communicate. Just in case we didn’t sympathize with them enough, Jurassic Park III gives them a motivation for hunting down the humans: They want their eggs back. It’s a ploy for sympathy so effective that Jurassic Park has done it twice! The T-Rex in The Lost World was also looking for its baby. But where it was a brute injuring the people who helped her injured child, the Velociraptors are justified in their anger, since their eggs were just flat-out stolen. And they leave once they get them back. Lest we become too sympathetic to the Velociraptors, keep this in mind: they have the highest human body count of any species in the movies. And they don’t wound, they kill. Do not mess with the velociraptors. The humans are pretty flat — when they’re not stupid. The T-Rex gets her position as the big, angry carnivore topped by the Spinosaurus in Jurassic Park III (and, it looks like, topped again in Jurassic World). It’s only the Velociraptor that grows smarter, more complicated, and more sympathetic with every movie. That’s why they’re the real glue holding the series together.